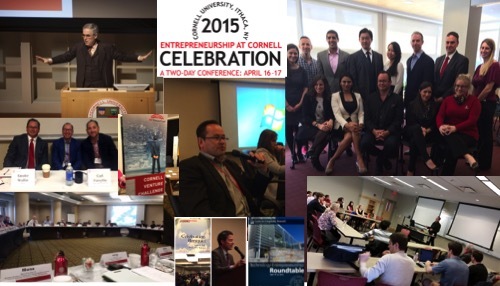 I had the opportunity to participate in Entrepreneurship @ Cornell last week. Besides it being enjoyable to get back to campus after a 15-year hiatus, I left feeling inspired by the people I met. 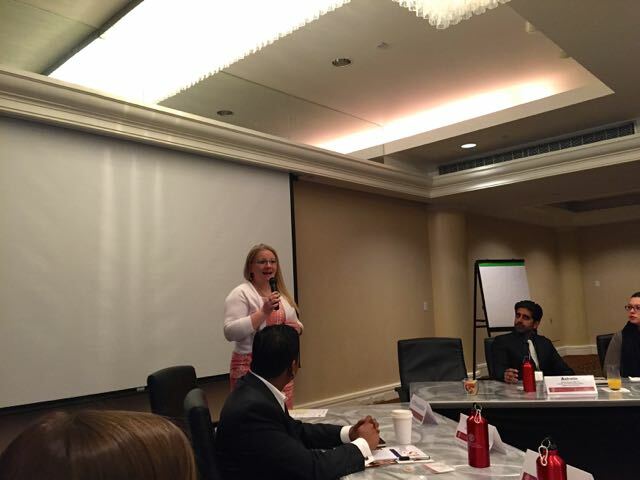 This included my fellow speakers, attendees, the faculty and most importantly the Cornell students. Anyone worried about the state of America today and the next generation of leaders need only spend a week like mine to gain a renewed sense of optimism. More than anything, the drive to create new enterprises to solve new and old problems with innovative approaches and the sense that “no one can stop me” I got from so many individuals was gratifying. 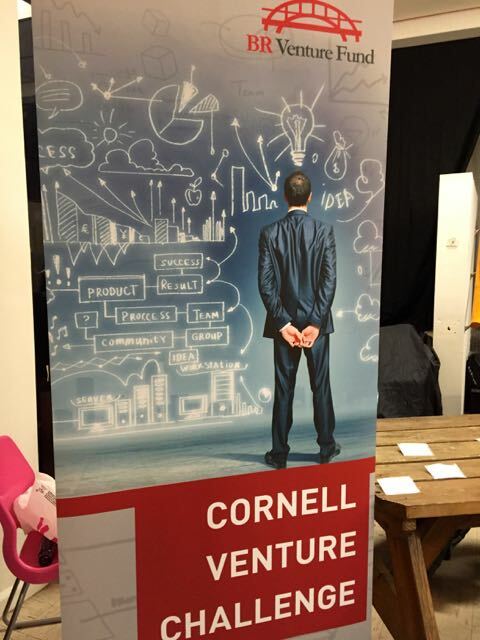 Cornell seems to be doing a better job than most university systems in coordinating across the various schools to support and encourage entrepreneurship. 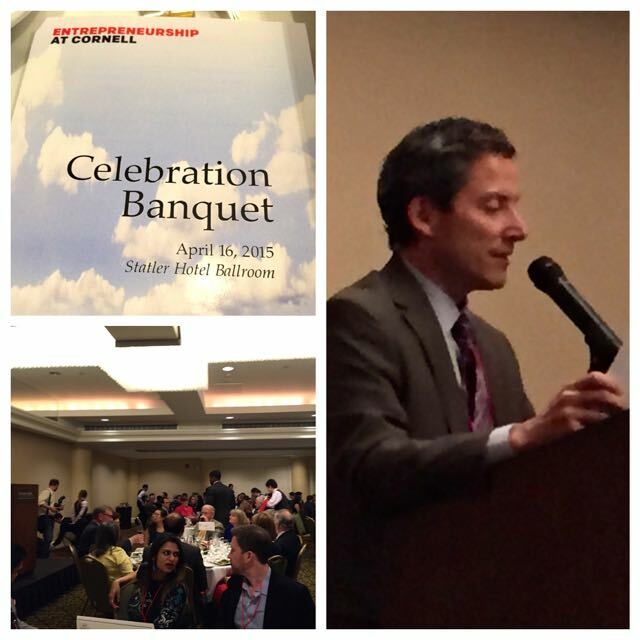 As Director of Entrepreneurship @ Cornell, Zach Shulman said, “I have 13 bosses. 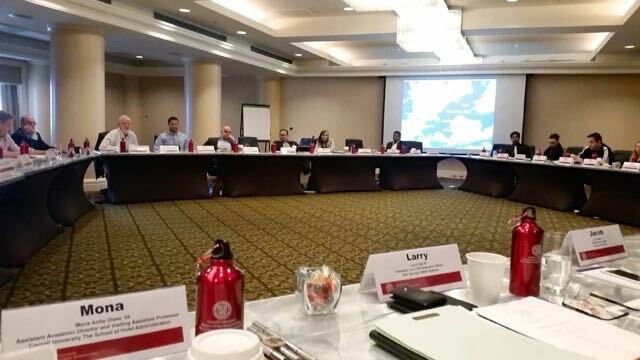 I report to all 13 Deans and they all support our activities.” The ability to cut across schools as diverse as Agricultural, Business, Hotel, Engineering, Industrial & Labor Relations, Law and support would be entrepreneurs regardless of their chosen field is powerful. 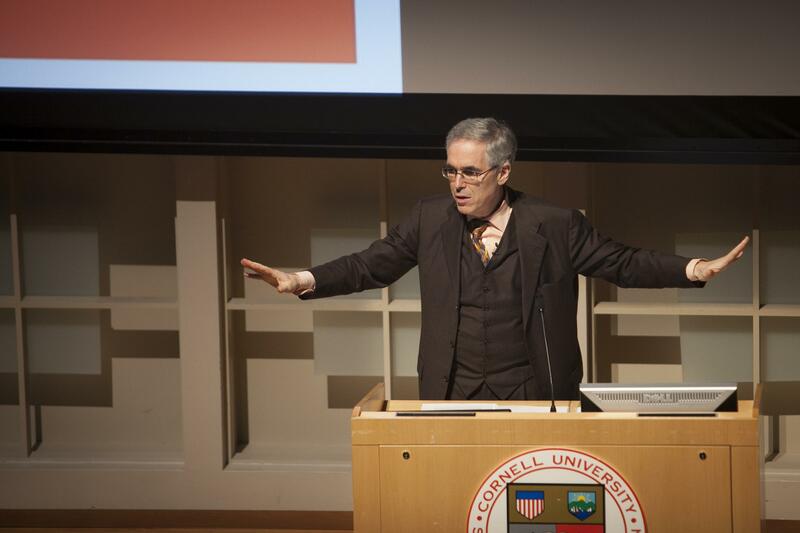 Jay Walker ‘77, a keynote and founder of Priceline.com and Walker Digital put the entrepreneurial bug in perspective by calling it a “disease”. Do you have it? If you do, you can’t get rid of it. He also made a great point that you don’t build a company with a group of people who ALL have the disease. That would not be successful. You need a team that can build processes, and get things done. That certainly fits my experience. 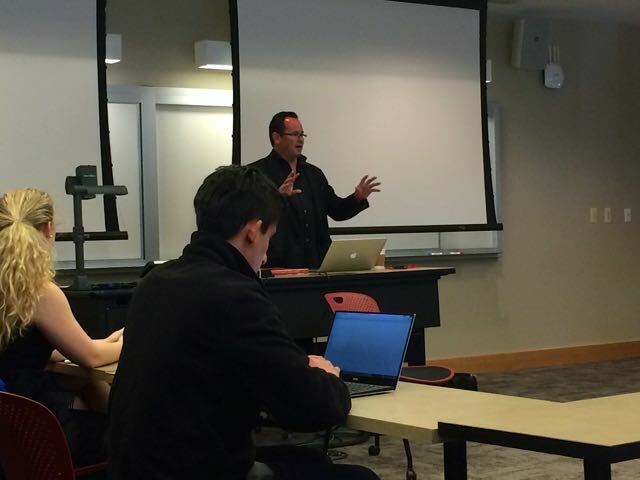 As I said to some of the classes, we are glorifying the entrepreneur this week and it is a great thing. However, one does not build a business with all entrepreneurs. One builds a business with a team of people with complimentary skills and ability to execute. Every visionary who can articulate the future and see what no one else sees, needs someone pulling back asking the questions: that sounds great, but how do we DO that? What needs to be in place to make it work? What about these problems? One must have a balance and the how do you actually do what is being proposed way of thinking is critical. Jay went on to identify 10 ‘superforces’ – Jay Walker shares 10 ‘superforces’ of the business future. 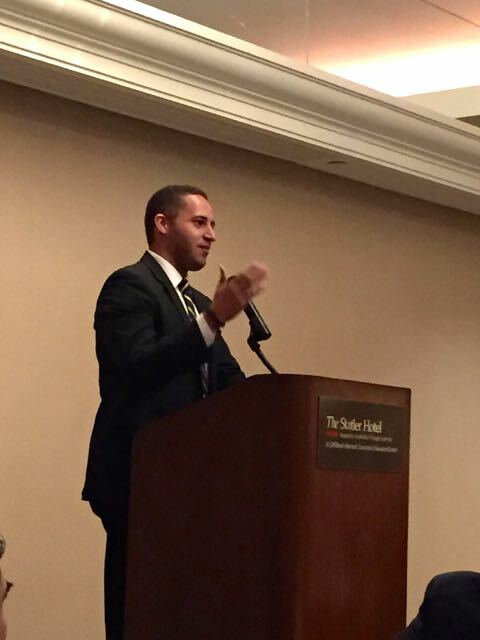 At the opening night banquet, the superstar Mayor of Ithaca, Svante Myrick addressed the group. Mayor Myrick is truly a remarkable leader. He called all entrepreneurs the “annoying” people without whom, nothing would change. 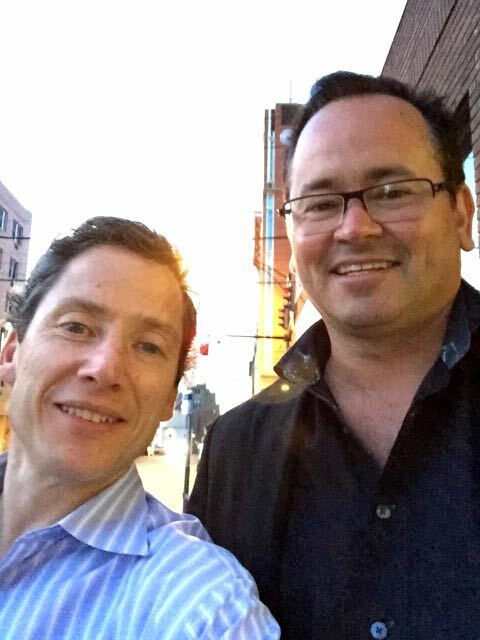 When I commented to Jay Walker that I’d like to see Mayor Myrick in higher office, he said something with which I immediately agreed… “We need fresh leadership doing good things at the local level. Let him do that now.” In the excitement for how good I think he is and his potential on a larger stage, its easy to forget that we need a whole bunch of Svante Myricks doing exactly what he is doing locally in this country. 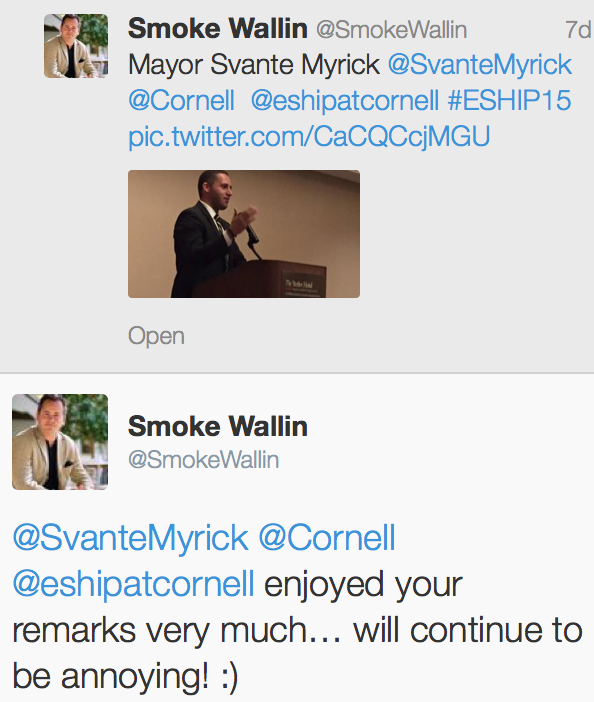 The Mayor and I got into a little twitter exchange after his talk above. 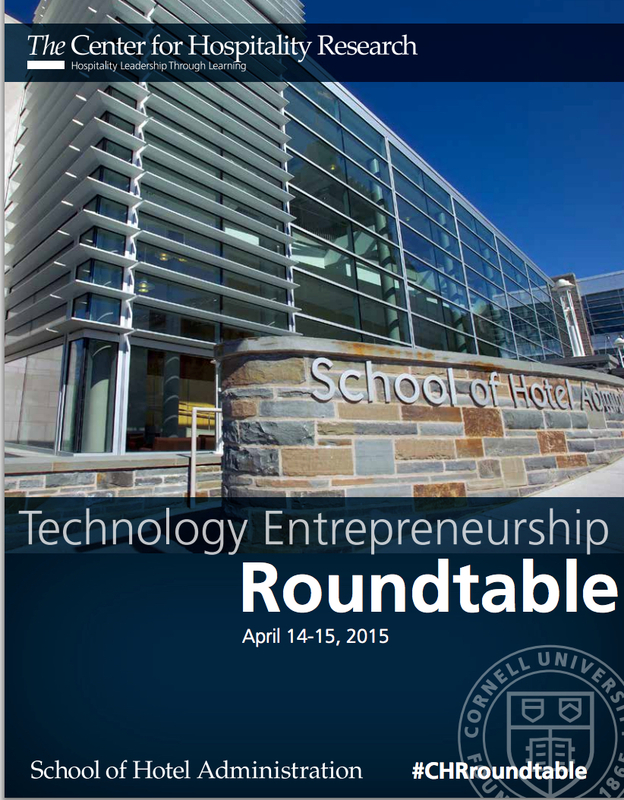 Leading into the celebration, I had the privilege of participating on the CHR Technology Entrepreneurship Roundtable at the Cornell Hotel School. 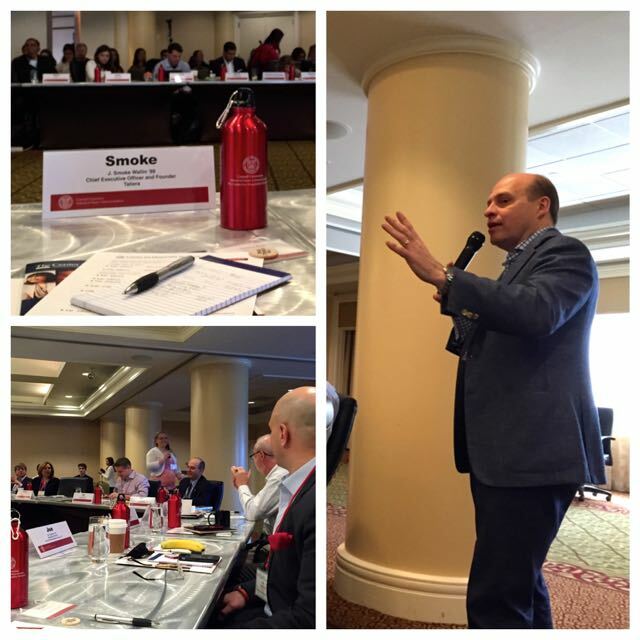 This roundtable was of the highest caliber and I really enjoyed learning from and debating the latest developments in hospitality and how technology is affecting everyone’s businesses. 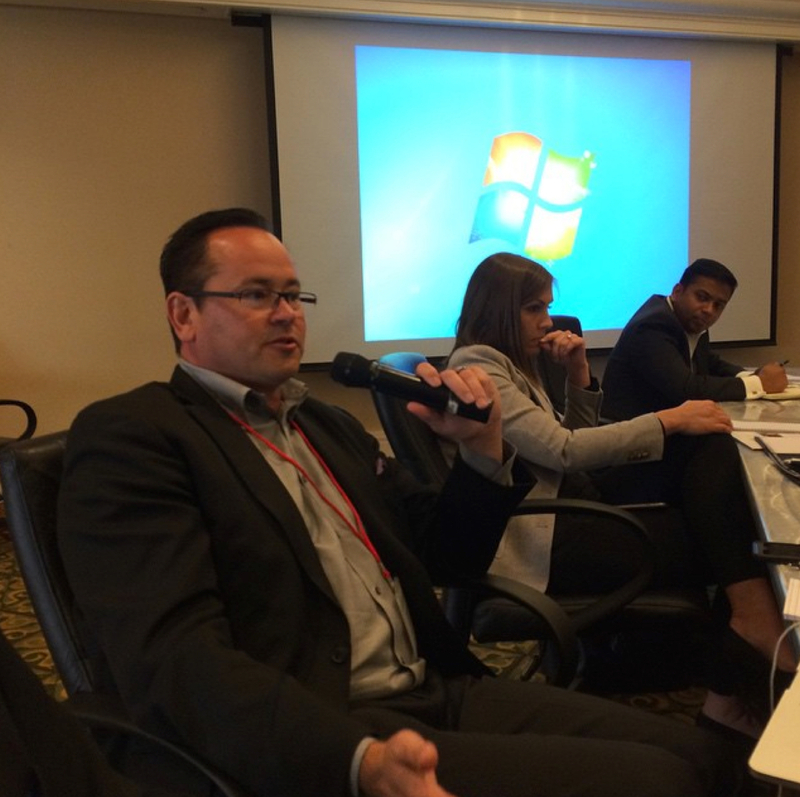 There are several people I met through the roundtable with whom I will remain friends far into the future. 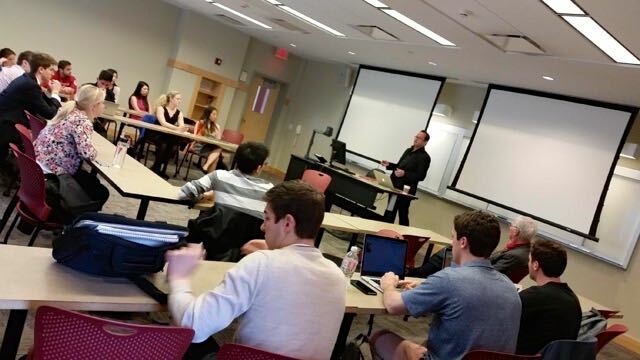 I presented the case for why today is better than any other time for new brands to reach their audience, which led the group to a discussion of the asynchronistic nature of startup/new brands vs large established brands. This applies to hotels and to beverage brands. The bottom line is using today’s technology, a new brand can communicate with its core following or “Tribe” directly, something that in the past was nearly impossible or cost prohibitive to do. Larger established brands have a much harder time competing at that level and by their very definition, cannot micro market as easily. Jamey and Carl both brought great perspectives as we took turns telling stories and engaging with the audience. 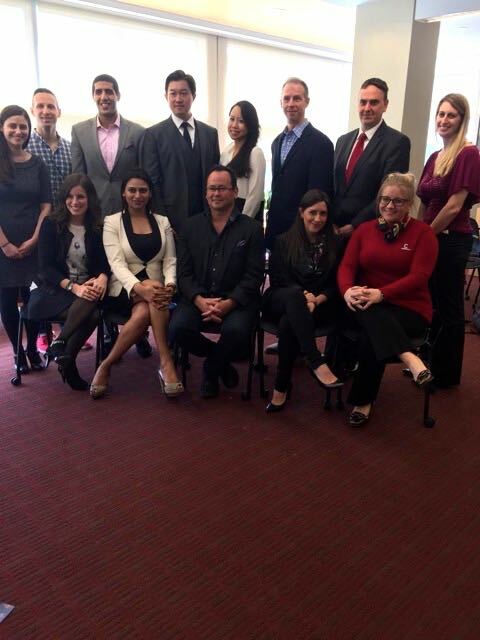 The Pillsbury Institute for Hospitality Entrepreneurship hosted two panel/socials that promoted a group of entrepreneurs interacting with students. 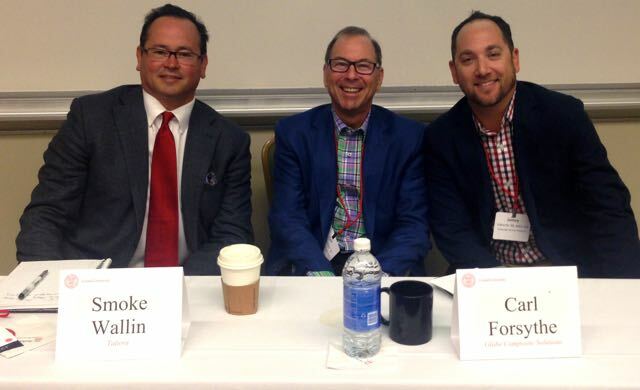 Both of these were a lot of fun as I enjoyed the panels and students! Finally, I’ve had a half dozen follow up calls and discussions with student entrepreneurs since last week. These folks are pushing ahead with their various new ventures and represent the future of our country. I am pleased that I can play a small role in giving them input/guidance on their respective journeys.